Happy eve of 4th of July, everyone! Here’s my Truth-Day, Tuesday share featuring Rancho Community Church’s Sunday lesson by Scott Treadway. Scott is the lead pastor and president of schools for RCC. Scott Treadway has a way of deconstructing a complex and often confused topic to something relatable and practical. His commentary although provocative at times is backed by historical data, common-sense values, scriptural foundation, intellectual and humanity-based researches. His storytelling is not only comprehensive, but it also speaks to the core of everyday and institutional issues. His metaphors are suitable to the current affairs. His teaching touches on varying perspectives from the global to the individual. His cause and his motivation are simple and practical: preach on the movement started by Jesus Christ – a life that strives towards the Lord’s Prayer of making the kingdom of God come on earth as it is in heaven instead of mystically waiting for a new life after death. Be a community of people advancing the causes of Jesus Christ, loving everyone everywhere. During his last Sunday’s teaching, Scott preached on John 4 with a brief reference to John 3. In his presentation, he stressed that Jesus came for both the legalists and the mystics. The legalists believe that God will bless and give eternal life if we are devoted to obeying his commands. The mystics believe that God will bless and give eternal life if we are devoted to a spiritual/emotional connection with him. The legalist and the mystic in the Book of John are represented by Nicodemus and a Samaritan woman. Jesus debunked the legalist and mystic beliefs and their way of life and offered both the living water. 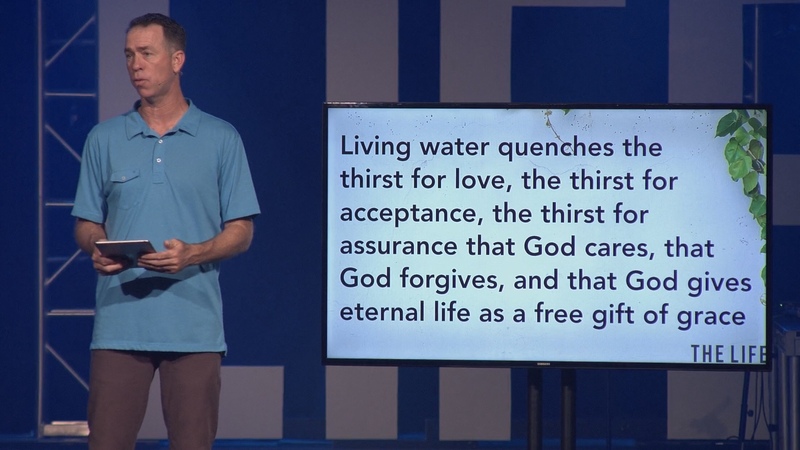 The living water is God’s love and unconditional grace poured on us. 1. Never believe they’re good enough. 2. Driven by guilt and threats. 3. Never confident in their standing with God; at best, their confidence is seasonal. Both experience internal shame. 4. External judgments, a tendency to criticize and judge others who are not as impressive as them. On this Sunday teaching, Scott suggested to consider, every now and then, to head north. Jesus against the urging of his disciples not just headed north where the Samaritans lived, but he also interacted with not just a regular Samaritan but a Samaritan woman. Jesus on his way back to Galilee refused to take the route going east where the possibility of interacting with the outcasts was remote. Just like Jesus, the calling is to be comfortable with the uncomfortable. Love everyone everywhere. One other salient point mentioned in Scott’s lesson is about the historical and biblical racial and gender biases. He empirically emphasized that there is only one human race. Genetically, there is no such thing as race. Spiritually, he says, there’s something broken in us because there’s actually no physical racial distinction. Jews for over two thousand years believed that Samaritans are different from them. They discriminated against them, treated them as a pariah, and forbid inter-marriage. If a mixed marriage would happen, they weren’t accorded with dignity and respect. Recent genetic studies of the remaining indigenous tribe of Samaritans reveal that the Samaritans are descendants from the tribes of Israel dating to before the Assyrian exile in 722-720 BCE. In short, the Jews shared the same lineage as the Samaritans they discriminated against. The thing is, many of the Bible workbooks used today in study groups justify the discriminatory practices of the biblical jews as Godly. They’re not. Not in humanitarian standards. Never in God’s measure. The measure of the human’s teaching of God’s truth lies in love alone. If it’s not about love and it’s not loving, then it’s not from God and of God’s will. Scientific researches dispel a biological concept of race. However, we humans, differentiate by skin color. We love and treat people based on skin tone, accent, height, body size, and even the shape of a person’s nose. On the gender bias, Scott talked about how women were mistreated historically and in the biblical times. In biblical history, the women were referred to as gentle slaves. Women weren’t allowed to become disciples of rabbis. Jesus debunked the misuse of the letter of the law to discriminate against women and to prevent them from maximizing their full potential. Jesus broke the gender barriers. Jesus did not teach about gender inequality. In fact, He taught us to love and honor others as we love our self. He made a disciple out of the Samaritan woman who was both an outcast and a second-class citizen in her tribe because of being born with a “wrong gender” (John 4). Jesus launched women into ministry. Scott advised that the best thing a man could do to help a woman is to get out of her way. We can’t be harassing and looking at women as an inferior species or allowing such mistreatments and then claim that we are following the examples of Christ. Gender parity, #metoo, #timesup are not liberal issues. These are human issues that are aligned with the causes of Christ. The bias toward women comes against the love of God. Love does not discriminate. Here’s Scott’s full lesson recorded last Sunday and published via Vimeo, https://vimeo.com/278062440.